I read it after I finished an MA in Writing and it was exactly what I needed to burst my bubble. I loved it because it questioned everything and it perfectly matched my skepticism towards creative writing courses. Regardless of my amazing experience within the creative writing masters, nobody can teach you how to write, but somebody can definitely teach you how to rewrite and how to read. In a world where everybody urges you to be original, creative, Goldsmith states that you can totally be creative with somebody else’s work with a little help from the Internet: word processing, databasing, recycling, sampling, appropriation, coding (‘Pure Poems’ written by Shigeru Matsui in alphanumeric binaries), plundering, programming, and even plagiarizing. Yes, plagiarizing. The most eloquent example (I love it) is this essay entitled ‘The Ecstasy of Influence: A plagiarism’. Jonathan Lethem brilliantly shows us that nothing is original in literature – all ideas has been shared, recycled, stolen, quoted, translated, re-translated, imitated, pirated, patch written, re-written and so on. The essay is the perfect example for this – not a single word or idea belongs Jonathan Lethem. Everything is borrowed from others’ books, ideas, writings. 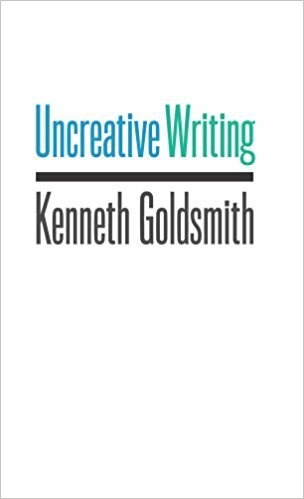 Goldsmith even taught the ‘Uncreative Writing’ course at the University of Pennsylvania where students were not allowed to bring to the class any trace of originality and creativity. Can techniques traditionally thought to be outside the scope of literature, including word processing, databasing, identity ciphering, and intensive programming, inspire the reinvention of writing? The Internet and the digital environment present writers with new challenges and opportunities to reconceive creativity, authorship, and their relationship to language. Confronted with an unprecedented amount of texts and language, writers have the opportunity to move beyond the creation of new texts and manage, parse, appropriate, and reconstruct those that already exist. In addition to explaining his concept of uncreative writing, which is also the name of his popular course at the University of Pennsylvania, Goldsmith reads the work of writers who have taken up this challenge. Examining a wide range of texts and techniques, including the use of Google searches to create poetry, the appropriation of courtroom testimony, and the possibility of robo-poetics, Goldsmith joins this recent work to practices that date back to the early twentieth century. Writers and artists such as Walter Benjamin, Gertrude Stein, James Joyce, and Andy Warhol embodied an ethos in which the construction or conception of a text was just as important as the resultant text itself. By extending this tradition into the digital realm, uncreative writing offers new ways of thinking about identity and the making of meaning.